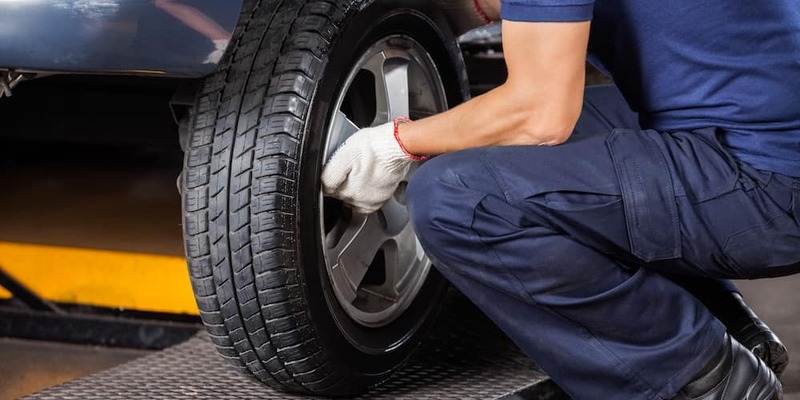 Tire rotations are important, but often overlooked, routine service that helps keep your vehicle running smoothly and extends the life of your tires. Whether you plan to rotate your tires at home or you’ll leave this service to the experts at your local O'Fallon service center, understanding how to do a tire rotation and why is crucial for all Mascoutah-area drivers. Engage parking brake for an extra measure of safety. Lift up one wheel with a car jack and place the jack stand underneath it. Repeat for each wheel. Take this time to make sure your tires are filled to the optimal tire pressure. Once filled, you can rotate them according to the appropriate pattern for your type of tires. Place the tire back onto the wheel mount and screw the lug nuts on by hand as far as you can. Lower the car from the jack stands and use the tire iron to finish tightening the nuts. It’s best to work the lug nuts diagonally from one to another in a star pattern to ensure even tightening. If the lug nuts aren’t tightened evenly it can cause the brake rotor to warp. Due to driving habits, all tires don’t wear evenly. Thanks to the impact they experience while turning in the Smithton area, the outside edges of the front tires show greater wear while the rear wheels wear more evenly. This means if you leave your tires in place they will wear down at different rates and you will have to replace them sooner. Uneven wear can also lead to unexpected behavior, including blowouts. Front and rear wheel drive vehicles generally need their tires rotated every 5,000 to 7,500 miles. All-wheel drive vehicles require more frequent changes at every 3,000 to 5,000 miles since all tires are actively engaged and that results in faster wear. As with any vehicle service, we always recommend checking your owners manual for more specific recommendations. Front-Wheel Drive Tires: You can move the front tires to the back of the car in the same left/right positions. When it comes time to move the rear tires to the front, you must switch the right and left tire. Rear-Wheel Drive Tires: The opposite is true with RWD vehicles. The rear tires can be moved to the front of the car in the same left/right positions, but when you move the front tires to the rear, you need to switch the left and right tire. If you prefer to leave services like tire rotations to the professionals, contact our service department or schedule an appointment online.